Skanda Sashti in October-November; Tirukarthikai in November-December; monthly Sankatahara Chaturthi; Vinayaka Chaturthi in August-September; Amavasya the new moon days and Hanuman Jayanthi are the festivals celebrated in the temple. A colossal size 19 feet tall Lord Sudarssana Murthy made of Panchaloka facing east and Lord Lakshmi Narasimha behind are installed in the temple. Against the tradition of Lord Yoga Narasimha occupying the rear side of Sudarsana Chakra, Lord Lakshmi Narasimha graces in the place. The Shivalinga Bana is taller than that of the one in Thanjavur Bragadeeswar temple. This has 1008 Lingas in itself – Ashta Sahasralinga. There will be 53 Lingas in each of the 19 lines making a total of 1007 and added with this is the Main Linga, thus making 1008 Lingas – Ashta Sahasra Linga. The height of the Thanjavur Linga is 7ft, 6 inches. The height of the Linga here is 8ft and 1 inch. 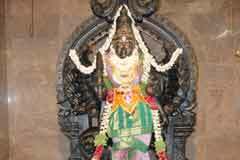 6 feet tall Nandhi adores the temple before the Linga. The weight of this Linga is 20 tonnes. The temple is open from 6.00 a.m. to 11.00 a.m. and from 5.00 to 8.00 p.m.
Sri Swaminathaswami Temple, Tambaram East, Skandasramam, Chennai – 600 073. +91- 44-2229 0134, 2229 3388, 94446 29570. There is daily midday Annadhana-feeding in the temple. Mother Annapoorani graces from this mandap. 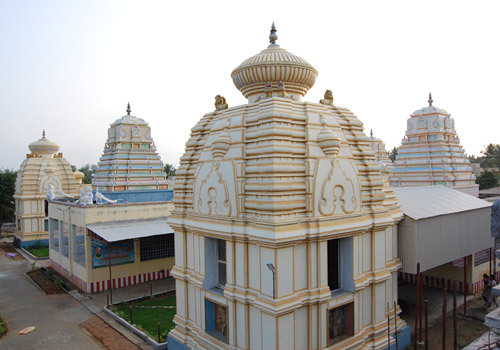 The towers of the temple are designed after Orissa temples. There is Dhyan-meditation mandap where devotees can peacefully pray. The Aiyappa idol made of Panchaloka is the biggest in the country. Mothers Ashta Dasabhuja Mahalakshmi (with 18 hands) and Deurga Devi grace the devotees. Devotees seeking wisdom and wealth pray to Lord Muruga facing west and those facing and affected by enemies pray to Lord Sarabeswara. Realizing their wishes, devotees perform milk abishek to the deities. Of the 32 forms of Ganapathy, 12 feet tall Lord Heramba Ganapathy adores the Skandashram temple with five faces, 10 hands seated on Lion vahan. He appears with an assuring hand-Abhaya Hastha, offering boons and holding tusk, pasa the rope, rudraksha mala, mavatti, parasu, pounding stick, modhaga and fruits. Special pujas are performed on Sankatahara Chaturti day. 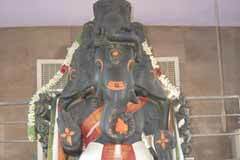 In the goshta of His shrine are Bala Ganapathy, Panchamukha Heramba Ganapathy and Lakshmi Ganapathy. Lord Muruga in the temple is praised as Swaminathaswami. The idol is 12 feet tall facing west as in Palani. He is holding Danda in the right hand, placing the left on the waist with His worshipful Vel placed above the right hand offering all boons to the devotees. It is believed that worshipping west facing Muruga brings in to the devotee wisdom and wealth. He is standing politely before His Mother Bhuvaneswari who gave Him the Vel to win demon Surapanma. Lord Muruga also enjoys the status as the Teacher of Father who Himself is a Guru. 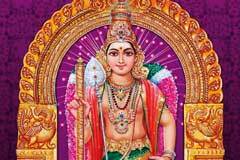 Devotees feel it important to worship Muruga on the Guru (Jupiter) transition day. During the Skanda Sashti festival, He is dressed in different forms. Special abisheks are performed on Kruthika star days. There are nine forms of Muruga in this shrine – Balamuruga, Kathirkama Muruga, Aarupadai Muruga etc. Sri Panchamukha Anjaneya graces with His five faces on the northwest corner-Vayu Moola. He has the Vanara (Monkey) face on the east, Narasimha on the south, Garuda on the west, Varaha in the north and horse looking upward. 12 feet tall Panchamukha Anjaneya appears with sword, trident, tree, hill, pasa the rope, Angusa the controlling whip, Chinmudra teaching philosophy, pindipalam, Gatwangam, Kundika etc. Special abishek and pujas are dedicated to Him on new moon days, Moola star days and Hanuman Jayanthi. Those facing adverse Saturn (Sani Bhagwan) aspects pray to him. There are also Panchmukha Anjaneya, Bhakta Anjaneya and Veera Anjaneya on the Goshta wall of His shrine. Lord Sarabeswara seated on a 10 feet tall peeta appears with deer, Mazhu-battle axe, serpent and fire in His hands. Abisheks are performed to Him and the Linga before Him on special days, Pradosha days and on Rahukalam time (4.30 p.m. to 6.30 p.m.) on Sundays. Those affected by their enemies worship Lord Sarabeswara for total relief. Mother Prathyangara Devi appears just opposite Lord Sarabeswara. It is said that She came into being from the forehead eye of Lord Shiva. According to scriptures, Lord Sarabeswara was able to soften the fury of Lord Narasimha only with the assistance of Mother Prathyangara Devi. 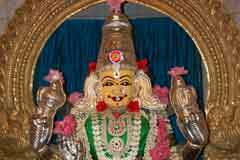 Devi is 10 feet tall with the face of lion holding many weapons as trident, Kabala, Pasa, Damaruka etc. Special abishek and pujas are dedicted to Devi on New Moon days. Prathyangara Devi Koti Homa is conducted each day to enhance the powers of angels (Devadas) from 9.15 a.m. to 11.15 a.m. chanting the mantras one crore times. Lord Sudarsana Murthy is 19 feet tall, colossal in size facing east. Lord Lakshmi Narasimha is behind facing west. Instead of Lord Yoga Narasimha on the rear side of the Sudarsana Chakra as a tradition, Lord Lakshmi Narasimha occupies this side in this temple. Devotee Prahlada is nearby. 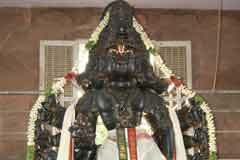 5 feet Lord Venkatachalapathy appears opposite the Chakra. Ashta Sahasra Linga: The Bana part of the Linga is bigger than the one in Thanjavur temple. It has 1008 Lingas carved in itself. The height of the Thanjavur Linga above the Avudayar is 7 feet 6 inches. Here the height is 8 feet 1 inch. There are 53 Lingas in each of the 19 lines making a total of 1007 lingas. Added with the main Linga the final total number of Lingas comes to 1008. 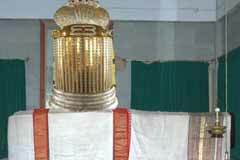 Six feet tall Nandhi is before the Linga weighing 20 tonnes. Around this shrine are the idols of Lords Dakshinamurthy, Venkatachalapathy with Alarmel Mangai Thayar and Brahmma. Dattatreya, celebrated as the Acharya of Threta Yuga is a combined form of Lords Brahmma, Vishnu and Shiva. He was born to Sage Athri and Anusuya. He is about 12 feet tall in this temple worshipped with special pujas on full moon days. Sani Bhagwan: He is a powerful planet. 12 feet tall Sani Bhagwan graces in the temple with His place opposite Sri Panchamukha Anjaneya with his right leg placed on his crow vehicle. People throng this shrine for relief from the adverse aspects of the planet. Special pujas are performed in the shrine on the first Saturday of each Tamil month. Sri Chakra Puja: Five feet tall Maha Meru (a form Sri Chakra) made of Panchaloka is installed at the centre of the temple with Maha Tripura Sundari as the deity. Navavarna puja is dedicated to Sri Chakra on new moon, full moon, chaturdasi, Ashtami, Navami days in the evenings. It is the staunch faith of Hindus that worshipping Mother Maha Tripura Sundari on these puja days would free them totally from the adverse effects of planets assuring a peaceful and happy life. Also daily Sri Durga Saptha Sathi chanting between 4.30 p.m. to 5.30 and Gopuja at 7.00 a.m. are conducted in the temple ensuring the grace of Mother Mahalakshmi to the devotees. 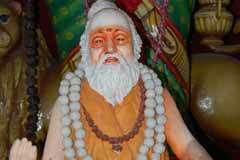 Sri Swayamprakasar is the disciple of His Holiness Judge Swamigal of Pudukkottai. Sri Santhananda Swamigal is the disciple of Swayamprakasar. His original name was Subramaniam. Based on this name, the Ashrams-temples established by Him are known as Skandashramam. 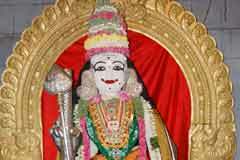 Salem Skandashramam was also established him. He attained Mahasamadhi on May 27 in 2002. Miracle Based: The Bana part of the Linga is bigger than that that of the Linga in Thanjavur temple containing in itself 1008 lingas. Nandhi is 6 feet tall. The weight of the Linga is 20 tonnes. Idols of Lords Dakshinamurthy, Venkatachalapathy with Alarmel Mangai Thayar and Brahmma are around the Shiva Linga shrine. Skandashramam is 3 km from Thambaram. Buses to Velacherry can be used. The devotee should get down at Camp Road stop.